I was just 15 when I attended the Dublin festival with my group of summer friends from Malahide. I am from Madrid (Spain) and spent many summers learning English....music was all over the place and The Police concert was a must. I do remember some punks targeting Sting with bottles and glasses, throwing anything really. The Police stopped playing their unfortunate the dododo the dadada, when finally one of them was hit and Sting shouted "hey you lady the one with the red hair, get the f. Out!!!" Much to our surprise it was really U2 the group that excited the audience and made all of us vibrate... it was with U2 rhythm that we jumped close to the scene ....though could not see much. One of my friends realized that we knew those guys!! they are also from Malahide!! The journey back to Dublin was a long.... huge bus traffic jam! Since I first heard U2 I have been touched by the Malahide guys and missed none of the Madrid concerts! Now live U2 concert in Madrid with my teenagers and wife!! 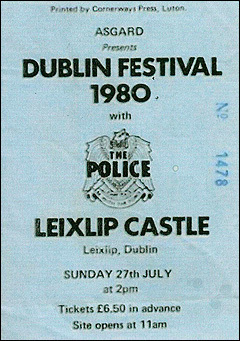 At the time i went it was for the Police but U2 stole the show. I remember Bono climbing up on top of the stage, pretty dangerous back then. A Day without Me sticks clearly in the memory. Happy day.. , haven't missed a gig in Ireland since.. Seems I forgot to add the ticket, only GBP 6,50, but woth a fortune for what we saw and listened to there. I'm from Valencia (Spain), it was my second Summer studying English in Dublin, I had just turned 16 three days before and I went to see The Police, my favourite band at the time, with four friends of mine also from Valencia, and I discovered U2 there. They were the local band on the gig and didn't know them then, but I could see they had a huge crowd of local supporters. I also wish I had some pictures, but I don't so I'll add the ticket of the festival. The line up of the festival was. 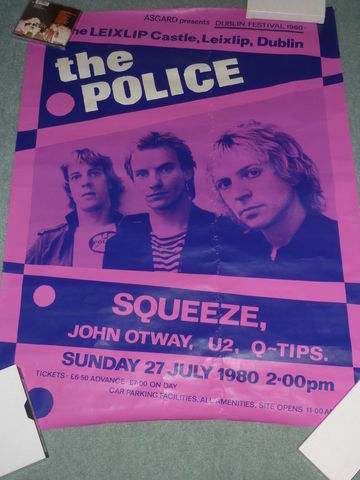 The Police, Squeeze, John Otway and U2. Besides the music, my memores of the show bring me Bono climbing the scaffolding by the stage and sliding from the curtains, and walking 15 kms. back to Dublin because we missed our bus, and local police driving us to Ballinteer, where we were staying, after that. Great memories ... and several U2 concerts since those days. I was in one iNNOCENCE & eXPERIENCE show last week in Barcelona, and I'm taking my six years old kid to his first U2 concert in the O2 in London in two weeks. It will be innocence and experience together. "Time is a train, makes the future the past ..."